After a long day at work, you don’t want to spend a lot of time prepping and cooking a meal. 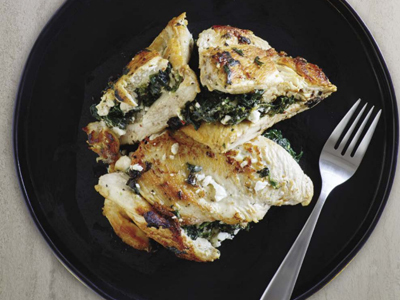 The Spinach and Feta Stuffed Chicken recipe found in THE “I LOVE MY INSTANT POT” KETO DIET RECIPE BOOK is deliciously creamy and packed with nutrients. Check out the recipe below. Stuffed chicken sounds fancy, but it’s really an easy weeknight dinner. The spinach adds powerful nutrients to this meal while balancing out the creamy feta. Serves 4. 1) Pound chicken breasts to ¼-inch thickness. In medium bowl, mix frozen spinach and feta and add ¼ teaspoon salt. Evenly divide mixture and spoon onto chicken breasts. 2) Close chicken breasts and secure with toothpicks or butcher’s string. Sprinkle remaining seasonings onto chicken. Press the Sauté button and add coconut oil to Instant Pot®. Sear each chicken breast until golden brown (this may take two batches). Press the Cancel button. 3) Remove chicken and set aside briefly. Pour water into Instant Pot® and scrape bottom to remove any chicken or seasoning that is stuck on. Place steam rack into pot. 4) Place chicken on steam rack and click lid closed. Adjust time for 15 minutes. When timer beeps, allow a 15-minute natural release, then quick-release the remaining pressure. Serve warm with favorite white sauce if desired. Click here for more recipes for easy weeknight meals. Excerpted from The “I Love My Instant Pot” Keto Diet Recipe Book by Sam Dillard. Copyright © 2018 by Simon & Schuster. Used by permission of the publisher. All rights reserved. Authorized by Instant Pot—the cookbook that makes using your Instant Pot easier than ever! The first cookbook to combine the hottest diet trend—the ketogenic diet—with the hottest kitchen appliance—the Instant Pot, featuring 175 low-carb, high-fat recipes for fast, delicious meals the whole family will love.The ketogenic diet is one of the most popular diets right now—and for good reason. It combines a customized carbohydrate restriction, moderation of protein intake, and real food-based fats. Followers of this lifestyle experience weight loss and improved energy, and never feel deprived thanks to its flavorful, natural whole foods! Emerging research is also showing this diet improves a wide range of diseases, from Type 2 diabetes, to Alzheimer’s, and more. 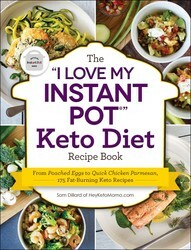 Featuring photographs throughout, “I Love My Instant Pot” Keto Diet Recipe Book will show you how you can use the hottest kitchen appliance—the Instant Pot—to create keto meals that are quick, easy, and most importantly, delicious. The Instant Pot can make cooking almost six times faster while using seventy percent less energy than traditional cooking methods. The Instant Pot is the only gadget that can replace a slow cooker, rice cooker, and stockpot, and this is the only cookbook with keto diet recipes for this device. You will learn how to make satisfying, whole-food dishes for every meal from breakfast to dinner, snacks to desserts—and something for everyone at your table!